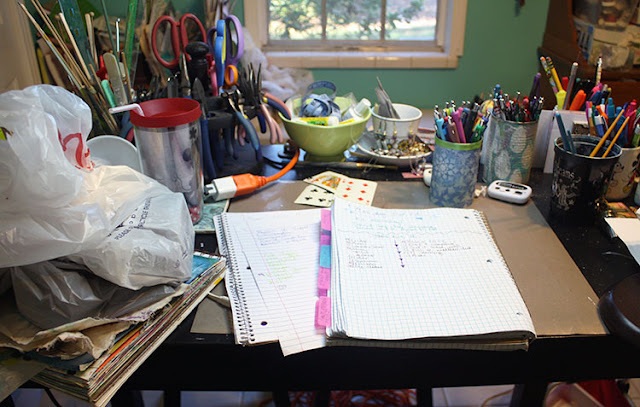 Once again, I'm joining up with other crafty and talented individuals to share our work desks at Stamping Ground for What's on your Workdesk Wednesday. Before I reveal my desk, let me show what became of some of the junk on my desk from last week. This necklace was made with those bits. Now for my desk. It's a little less crafty. Sigh, lots of to do lists. But, if you look there on the left you see my little pile of bags. I've spent the last couple of days doing some shopping with my birthday money. 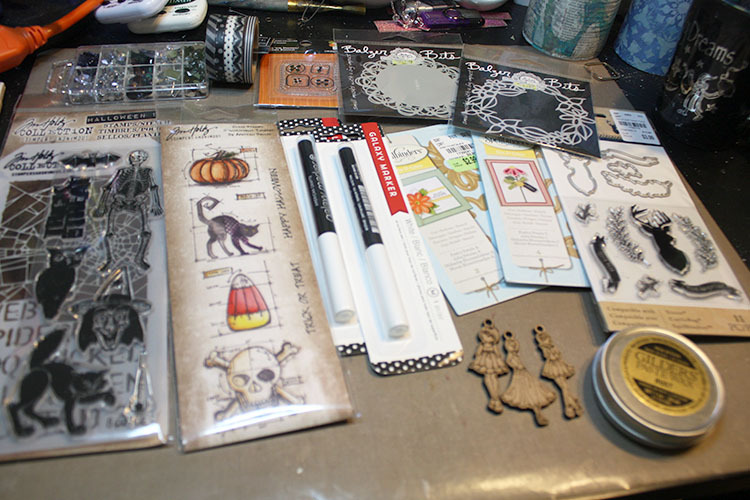 Let's see...the Tim Holtz stamps (and stencil) were on sale at Michael's. Above them is a rhinestone assortment and some washi tape from Hobby Lobby. Along the top, next to the washi tape is a button stamp and some masks. There are two galaxy markers I got that the dollar spot at Target. I'm not sure how they'll work, but figured I'd try. Then, there are a couple of dies and a die/stamp set from Tuesday Morning. Finally, some little Prima girls and rust-colored Gilder's paste. 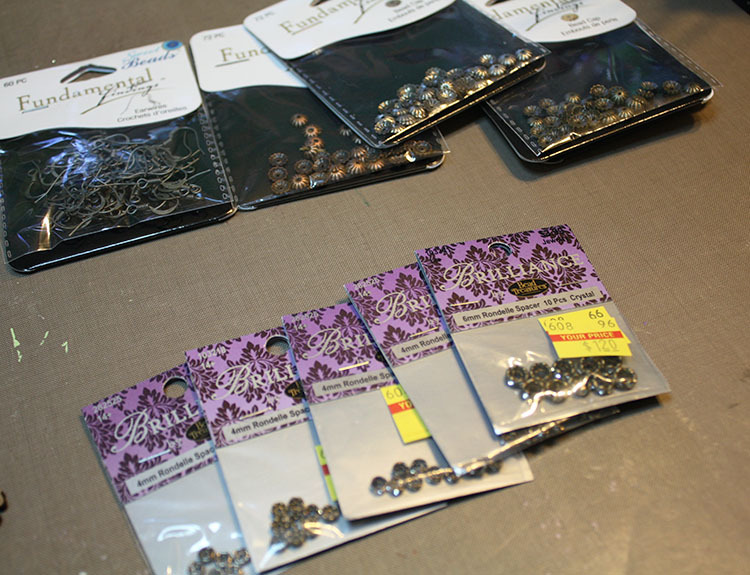 I also got a few jewelry supplies. I found the ear wires and bead caps at Tuesday Morning and the rhinestone spacers on clearance at Hobby Lobby. So that's my desk for the week. I've still got a little more birthday money and am trying to decide what else I need. Gimmie some recommendations. What's the craft supply you couldn't live without? Shaz, I think so too! And, that doesn't even count some of the items ordered and bought yesterday! Ha!! Thanks so much for popping in! Gorgeous jewelry! And a sale on necessary items too! Nice Halloween paper supplies. The Holtz never goes on sale here. Keep smiling and creating. Pam, Thanks so much! Yes. I do love me a good sale. I don't have much Halloween stuff, so I thought it was the perfect time to pick some up! What a shame that the TH never goes on sale. :( Of course, I'm sure you can find all kinds of stuff that I couldn't, so there's that! Thanks for the sweet comment and dropping in. Lindart, Yes! And, I got even more yesterday. Just hopping around the desks has reminded me of a few more items I'd like to get. . .I think I'm going to spend all my birthday money on craft supplies. Ha! Thanks for the birthday wishes and for popping in! Zsuzsu, Oh, I'm so glad you like the necklace. The paintbrush really did work in perfectly. My mannequin was just covered in dictionary paper a few months ago. She was actually a flesh-tone plastic and super shiny. I've had for ages, planning on altering her and finally got around to it. I think she looks much better now. I'm pleased you agree! Thanks for swinging by! Looks like you found lots of bargain goodies Hope! The necklace turned out awesome! I LOVE the one I bought from you! Happy Crafting! Well, at the moment my Misti is my most used and useful crafting product. Got a bit of a shake on my left hand (luckily i a right handed) but the ~Misti certainly helps out with any shakes people might have. Love your shopping, wish we had Michaels, Joannes and Hobby Lobby, my favourite stores when I go to America. Great jewellery make too - reminds me of when I used to do some fab jewellery make ups with Ranger at CHA. Neet, I had a feeling someone was going to mention the Misti. I just learned about it last week while hopping desks. I think I need to do a little more research on it and see some videos to see if it would be useful for me as well. Thanks for the input!! What a shame not to have the chain stores. I do have to drive a bit of a ways to get to most of them (hit JoAnne's yesterday while I was a few towns over) and that's probably a really good thing! I bet you have some other great stores though that we don't have here. It's a case of "the other side of the fence" I'm sure. Thank you so much for your kind comment about the necklace. Especially if it reminds you of Ranger. . .I do love their stuff! Wow - some great finds! I love the Tim Holtz stamp. Looks like fun. Your necklace looks wonderful. Sharon, I'm pleased that you approve of the recent purchases. I'm pretty happy with them myself. Now to actually USE THEM!! Thank you for your sweet words and for taking the time to check out my desk! Hello Hope! Thanks for the visit! Look at you and your desk...you're a busy gal! 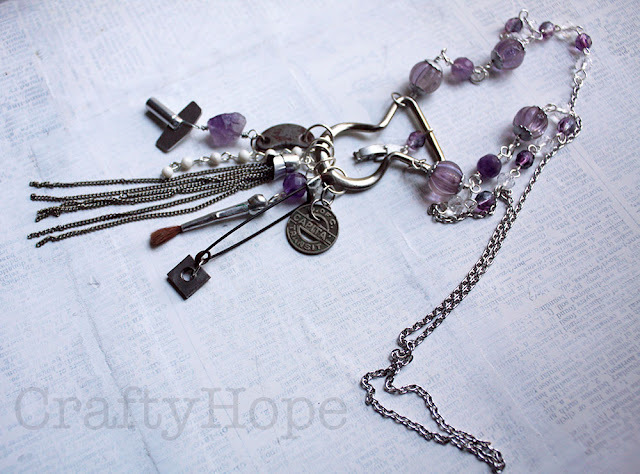 LOVE your necklace...gorgeous and so many goodies! WOW! Anita, Thank YOU for the visit! ;) I do stay very busy. My desk right now is out of control! I'm so pleased you like my necklace! Yay! Thanks again for dropping in! Good birthday buys! I have that little floral wreath stencil too. I do like your necklace very much! Vicky, Oh, thank you! I just had to share it, so many asked to see how the pieces on my desk turned out. And, thank you for your very true statement about need vs. want. I probably needed that reminder. Thanks for dropping in! Ohhh the necklace has turned out beautifully. You must be very pleased:0 Love the goodies you been able to pick up with your birthday $. I am sure you are going to put it all to great use. Lovely desk, fab makes - curious about the power cable! Kathyk, Oh thank you! As for the power cable, my desk is in the middle of the room. While I do have a 6-way on the floor, my cell charger cord is too short so I have an extension cord pulled up there for it. Nothing exciting! Ha. Thanks for popping in! Love the assemblage pendant! Everything looks absolutely in its place and is so unique! As to the desk, I love a desk covered with new buys! Unfortunately, there are lots of supplies I can't live without - my wire, my beads, tools... If we have to go some place for a longer period of time, I usually bring some wire, tools and beads even if I never come to use them. Anne, Thank you! So glad you like my goodies and my necklace! Yes, to do lists will keep you hopping for sure. I wouldn't know what to do without mine! :) Thanks for stopping by! Oh no. Not more stash to tempt me..... LOL Love the necklace you made, it's lovely! Thanks for your visit earlier, life is settling back down now. 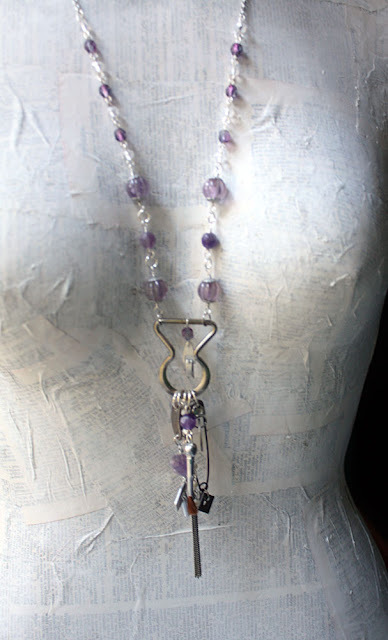 Love that mauve necklace, very clever. You sound like me, I shop Tuesday Mornings, HL, Michaels, and JoAnns. I even check in at Marshalls, and find stuff hidden behind things! Even Dollar Tree sometimes yields a "gem". Great haul you have there. 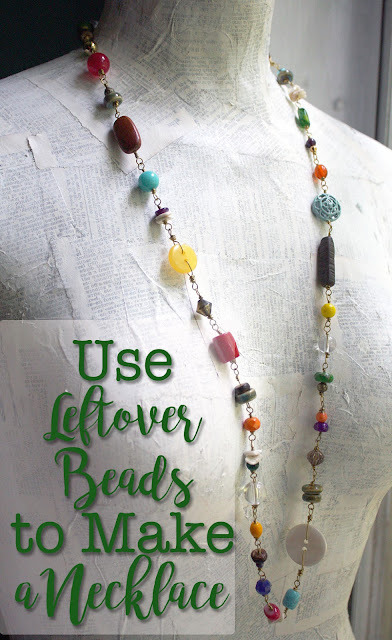 some lovely craft supplies and a great necklace you made. What is the one supply I could not live without? Difficult, I think my paints as I can use them on paper, fabric, leather, wood, metal....and even mix with glues etc.